Police displayed the drugs and guns seized in the operations at a press conference Jan. 11. Six months of surveillance by narcotics police in İzmir, Turkey's third-largest city situated on the shores of the Aegean Sea, paid off with an operation this week that ended up with the arrest of 17 suspects. 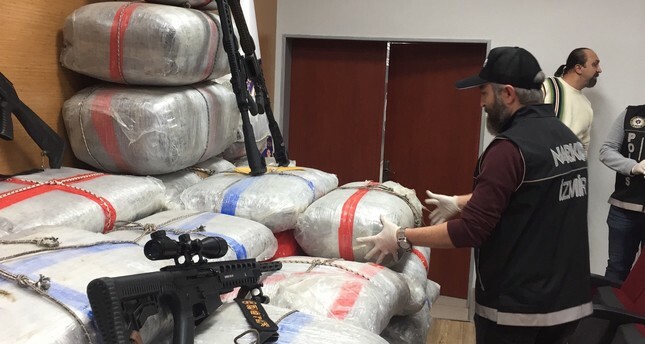 The operation also disclosed how smugglers used the Aegean Sea to transport the popular synthetic drug "skunk" into the country from European countries. Police have seized about one ton of skunk in a villa in Aliağa district in the operation and along with 16 suspects, detained a major from the Turkish army's gendarmerie forces. Anadolu Agency (AA) reported that the police launched the raid against the gang of smugglers after they transported drugs from an unspecified country to Foça district first. The suspects then loaded the shipment to a truck and took it to a villa in Aliağa while setting aside a portion for shipment to other cities. When the suspects moved to carry the drugs again from villa, police stormed the place. B.Ö., identified only by his initials, was among the suspects and police sources said he was a gendarme major and previously served as commander of a garrison in İzmir's Karşıyaka district. B.Ö. had arrived in İzmir from another city he was stationed shortly before the planned shipment and is accused of acting as a collaborator with the gang, using his job title to help them avoid capture. Four foreigners including three Syrians, were also among the suspects and they claimed they were paid to unload and load the shipment and were unaware of the contents of the cargo they carried. An unidentified foreigner who coordinated the shipment of the drugs from European countries remains at large while the gang's Turkish leader was among those detained. Skunk is a genetically modified or hybrid strain of cannabis and reportedly new popular drug among Turkish users. Named for its strong smell, this new drug has been gradually replacing bonzai, a readily available synthetic drug whose use was prevalent especially among youngsters over the past five years. Narcotics police stepped up their crackdown on drug dealers and the rings supplying them amid the country's mobilization campaign against all types of illegal substances. Bonzai use has declined some 80 percent but skunk, marketed as "organic" by peddlers, is viewed as an effective replacement. Nationwide data is not available, but in Istanbul, the country's most populated city, police seized more than 3.9 tons of skunk in 2017 and 2018. The drug is far more harmful than standard cannabis, experts say. Its source is disputed, though it is believed to have been developed in the United States before it was brought to the Netherlands, the marijuana capital of Europe. Like cannabis, it can be grown indoors with special lighting and temperature-controlled rooms. As a transit country for drug smugglers working between Asia and Europe, Turkey is looking to curb domestic drug use. In 2014, the government launched "The Rapid Action Plan against Drugs" to counter drug abuse and smuggling. The action plan covers all aspects of the struggle against narcotics, from raising awareness of their dangers and curbing demand to rehabilitation and treatment of addicts and facilitating social inclusion. It also paved the way for the establishment of "narco teams," specialized police units active in neighborhoods where drug sales are concentrated.